Recently I finished a Ten Stitch Blanket in Kauni yarn. It was a thoroughly enjoyable purl-free knit, and I love the result. Garter stitch projects like this one offer few serious challenges to the knitter. I have previously commented on the joining method that I preferred and my plan for I-cord edging. I wanted the edging to be part of the final spiral, not applied afterward. Applied I-cord has many wonderful uses. In this design applied I-cord would result in disjointed and very long spans of color. Instead I wanted the edging to match the outer spiral perfectly. That means knitting I-cord edging while knitting the last 10-stitch band on all four sides of the blanket. However, I had a limited amount of yarn and wanted the largest possible blanket. No wasted yarn on spirals that might have been. No having to stop dead in the middle of a long side because there was no more yarn. Before starting your blanket, weigh the yarn. Measure in grams if you possibly can; ounces will not let you be as precise. Once you have some of the blanket finished and have reached a corner, count how many 10-st x 10-ridge squares you have. Weigh the yarn not yet knitted. Do not weigh the blanket fabric itself, only the not-yet-used yarn. Take at least two measures of your progress. Three is even better. Build your spreadsheet to track a)number of 10 x 10 squares finished, b)amount of yarn in those squares (by subtracting from the original weight), and c)how many squares you are knitting from each gram of yarn. I knit about 1.4 squares from each gram, but please, please, do not use my results to estimate your own work. In your spreadsheet calculate how many squares you could have if you knit every bit of your yarn. I.e., multiply your figure for squares/gram by the total amount of yarn you began with. Round the square root down to a whole number. That will give you roughly the number of complete spirals you can knit up in a square blanket. Add I-cord stitches at the miter before you begin the final spiral. Knitting 3 extra stitches in each ridge will use a little bit more yarn than in the body of the blanket; adjust down by a spiral if your results look like you will barely make it with the yarn and gauge you have. That’s all. Pretty simple to calculate. Very reassuring to know exactly where to begin adding an edging. 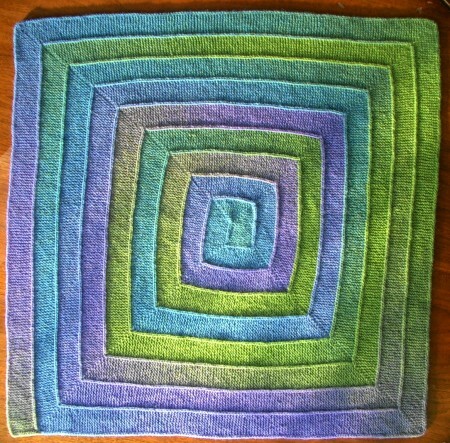 This entry was posted in knitting, technique and tagged edge treatment, Excel, I-cord, Ten Stitch Blanket. Bookmark the permalink.